The Porsche 911 GT3 was introduced in 1999 as a high performance version of Porsche's first water-cooled version of the 911, the 996, to continue the quarter-century tradition of low-weight RS models that ended with the 993 RS. The GT3, named after the FIA GT class it was intended for, did not use the rather simple engine of the regular production versions of the 996, but a naturally-aspirated version of the turbo-charged Porsche 962 and Porsche 911 GT1 race cars. Later, the turbo-charged Porsche 911 GT2 was added to the maker's lineup, but unlike its predecessor 993 GT2, did not fit into GT racing regulations. The racing versions of the GT3 have won several major 24h races outright, and mainly dominated their class at Le Mans. 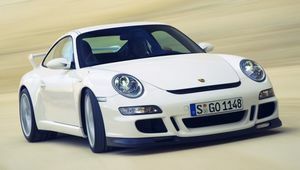 See Wikicars' comprehensive Porsche 911 GT3 Review. 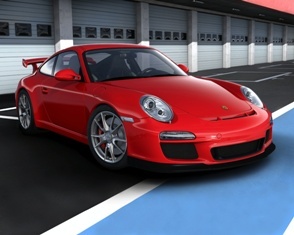 For 2010, Porsche updated the GT3 with a facelift and a power increase from the 3.8 litre flat-six to 435 hp and 317 lb-ft of torque. This is good for a 0-60 mph jaunt in 4.1 seconds and a top speed of 193 mph. Handling is improved as well, with a modified stability management system that allows for graduated settings for both stability and traction controls, along with enlarged carbon ceramic brakes that improve stopping distances. Prices start at €98,100 for most of Europe, €116,947 for Germany (incl VAT), $112,200 for USA and £81,914 for UK. This article is a stub. Help us expand it, and you get a cookie. This page was last edited on 29 June 2010, at 07:41.